Over the past two weekends we partially completed the insulation of the ceiling. It is a much harder task that can be anticipated. Working in small spaces with your access obstructed by joints, chords and other braces can be quite exhausting. The air, particularly in the attic, just gets filled with bits of insulation. I can't imagine what that does to your lungs. It was a cool day when we were up in the attic about 13 degrees Celsius not comfortable without a sweater outside. But the temperature still climbed in the attic. Perhaps the effort squeezing around up there made me even warmer, but I was drenched when we finished. I recommend light clothing! You should try to cover your entire body with some light clothing. 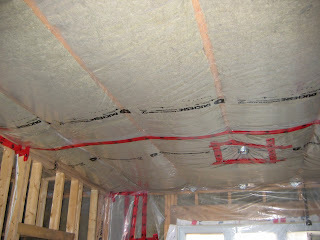 While the mineral wool is not as irritating as glass wool it still is a bit irritating. AND I recommend wearing gloves that reach up your arm. I had a white suit made of light weight Tyvek material left over from the spray foam task (see previous post), so I reused it. It proved to be perfect for insulation -- it was light and it covered me from head to foot. I ended up just wearing a t-shirt under the Tyvek suit - so I kept as cool as was possible.